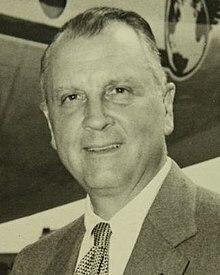 Juan Terry Trippe (June 27, 1899 – April 3, 1981) was an American commercial aviation pioneer, entrepreneur and the founder of Pan American World Airways, one of the iconic airlines of the 20th century. He was instrumental in numerous revolutionary advances in airline history, including the development and production of the Boeing 314 Clipper, which opened trans-Pacific airline travel, the Boeing Stratoliner which helped to pioneer cabin pressurization, the Boeing 707 which launched the Jet Age, and the Boeing 747 which introduced the era of jumbo jets (evolved from Air Force bombers, tanker and transport design, respectively). Trippe's signing of the 747 contract coincided with the 50th anniversary of Boeing, and he gave a speech where he explained his belief that these jets would be a force that would help bring about world peace. Trippe was born in Sea Bright, New Jersey, on June 27, 1899, the great-great-grandson of Lieutenant John Trippe, captain of the USS Vixen. Because he was named "Juan", he is widely assumed to have been of Hispanic descent, but his family was actually Northern European in ancestry and settled in Maryland in 1664. He was named after Juanita Terry, the Venezuelan wife of his great uncle. Trippe attended the Bovea School and graduated from The Hill School in 1917. He enrolled at Yale University but left when the United States entered World War I to apply for flight training with the United States Navy. After completing training in June 1918, he was designated as a Naval Aviator and was commissioned as an Ensign in the United States Navy Reserve. However, the end of World War I precluded him from flying in combat. Demobilized from active duty, he returned to Yale, graduating in 1921. While there, he was a member of St. Anthony Hall and of the Skull and Bones society. Trippe was treasurer at the first meeting of the National Intercollegiate Flying Association in 1920. After graduation from Yale, Trippe began working on Wall Street, but soon became bored. In 1922 he raised money from his old Yale classmates, selling them stock in his new airline, an air-taxi service for the rich and powerful called Long Island Airways. Once again tapping his wealthy friends from Yale, Trippe invested in an airline named Colonial Air Transport, which was awarded a new route and an airmail contract on October 7, 1925. Interested in operating to the Caribbean, Trippe created the Aviation Corporation of the Americas. Based in Florida, the company would evolve into the unofficial United States flag carrier, Pan American Airways, commonly known as Pan Am. Pan Am's first flight took off on October 19, 1927, from Key West, Florida, to Havana, Cuba, in a hired Fairchild FC-2 floatplane being delivered to West Indian Aerial Express in the Dominican Republic. The return flight from Havana to Key West, in a Pan Am Fokker F.VII, took place October 29, being delayed from October 28 by rain. Trippe served as the chairman of the board of directors of the airline for all but about two years between the founding of the company and World War II. "Sonny" Whitney, a stockholder, managed to seize this position. He later regretted his action and allowed Trippe to retake it. For a long time Trippe refused to pardon Whitney. At one point, he even agreed to meet Whitney for lunch for a reconciliation, but changed his mind and turned around shortly after departing from his office in the Chrysler Building. In 1965, Trippe asked his friend Bill Allen at Boeing to produce an airplane much larger than the 707. The result was the Boeing 747, and Pan Am was the first customer. Originally, Trippe believed the 747 would ultimately be destined to haul cargo only and would be replaced by faster, supersonic aircraft which were then being developed. The supersonic airliners failed to materialize, with the exception of the Concorde and Tupolev Tu-144, and the 747 became the iconic image of international travel. In 1965, Trippe received the Tony Jannus Award for his distinguished contributions to commercial aviation. Trippe married Elizabeth "Betty" Stettinius Trippe (1904–1983), the sister of United States Secretary of State Edward R. Stettinius Jr., in 1928. They had four children, Elizabeth ("Betsy"), John Terry, Charles White, and Edward Stettinius Trippe, who now resides in Tucker's Town, Bermuda, where he is executive director of the Tucker's Point Club and serves on Bermuda International Airport's advisory board. The couple remained married until Trippe's death in 1981. Trippe suffered a stroke in September 1980, which forced him to cut back on his workload; he died after suffering a second stroke at his New York City home on April 3, 1981, at the age of 81. He is buried in Green-Wood Cemetery in Brooklyn. In 1982, Trippe was inducted into the International Air & Space Hall of Fame at the San Diego Air & Space Museum. Trippe is widely regarded as the last of the greatest aviation pioneers along with industry titans such as American Airlines' C.R. Smith, United Airlines' William A. "Pat" Patterson, Eastern Airlines' Eddie Rickenbacker, and Delta Airlines' Collett E. Woolman. Under his control, Pan American World Airways became one of the premier international airlines in the world. He is also credited as playing an instrumental role in the development of an intercontinental version of the Boeing 707 and the Douglas DC-8 as Trippe's determination to get a jet that could cross the Atlantic was instrumental not only in Douglas developing a long-range DC-8, but also Boeing's famed 707 as they had to redesign it in order to stay competitive with Douglas. A character based on Trippe was played by Pat O'Brien in Ray Enright's 1936 film The China Clipper. Trippe was played by Alec Baldwin in Martin Scorsese's 2004 film The Aviator. ^ a b c "Juan Trippe, 81, Dies; U.S. Aviation Pioneer". The New York Times. April 4, 1981. Retrieved 2010-11-23. ^ a b "Juan Trippe, Pan Am Founder, Dies". The New York Times in the Daytona Beach Morning Journal. April 4, 1981. p. 5D. Retrieved March 14, 2010. ^ Daley, Robert (1980). An American Saga. New York: Random House. p. 7. ISBN 0-394-50223-X. ^ "Juan Trippe Entrepreneur". National Aviation Hall of Fame. Retrieved 2013-04-14. ^ "1920 NIFA Meet Program" (PDF). National Intercollegiate Flying Association. Retrieved 20 January 2012. ^ Gandt, Robert (1995). Skygods: The Fall of Pan Am. New York: William Morrow and Company, Inc. p. 12. ISBN 0-688-04615-0. ^ Gandt 1995, p. 13. ^ "A Trippe Down Memory Lane"
^ Carey, Charles W. (2009). American Inventors, Entrepreneurs, and Business Visionaries. Infobase Publishing. p. 343. ISBN 0-816-06883-6. ^ Hill, René (March 7, 2009). "Gala to benefit hospital". The Royal Gazette. Retrieved March 24, 2009. ^ Chaplin, Julia (June 19, 2005). "Going to Bermuda". The New York Times. Retrieved March 24, 2009. ^ "Elizabeth Trippe, 79; Active in Social Work". nytimes.com. May 14, 1983. ^ a b Mosca, Alexandra Kathryn (2008). Green-Wood Cemetery. Arcadia Publishing. p. 59. ISBN 0-738-55650-5. ^ "Yale School of Management / Faculty Directory". Retrieved 2012-07-23.